Friar Dan Gurnick, speaking to the guests. 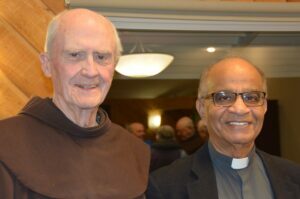 The Franciscan retreat house Mount St. Francis in Cochrane, AB, has been a place of peace and renewal for people of faith for almost 70 years, and the friars have been supported in their ministry by many faithful friends. 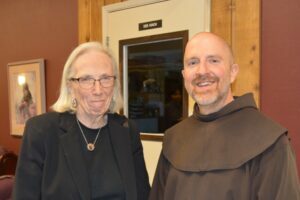 The recent reorganization of the Franciscan presence in Canada and the formation of a new province, the Holy Spirit Province, needed to be celebrated with them and explained to them. Friar Pierre Charland and Sister Lillian Rancourt, FMM. 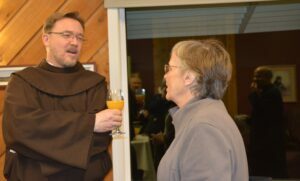 For this happy occasion, the Minister Provincial, Friar Pierre Charland, gave an overview of the reasons for the formation of the new Province and the potential that this has for the future of the friars’ work in Canada. Together with him, Friars Bob Mokry and Dan Gurnick spoke of the communities and their work in the other houses in Quebec, Alberta, and British Columbia that now form this new Province. Those in attendance were appreciative of the opportunity both to learn about the future of the friars in Canada, and to enjoy the company of old friends in a place that is very dear to all of them. Friar Kevin Lynch with Father Jack Pereira. Norline Johnson and Friar Dan Gurnick. 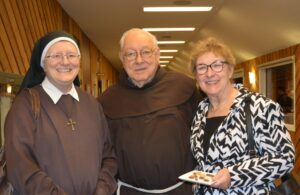 Sister Dianne Turner, OSE, Friar Louis Geelan, and Sister Dorothy Levandosky, OSB. Sister Theresa Smith, FCJ, Friar Bob Mokry, and Sister Donna Marie Perry, FCJ. FCJ sisters and friends, including Paul Merritt who, together with Jason Mackenzie, prepared the wonderful food for this event.